There are two words that will get us out of a comfy bed at 3:30 AM. Road Trip. A road trip is a state of mind but also implies movement which means we see some new stuff, eat different food, take more pictures and see how other people do things. We scammed our friends Phil and Nikki into driving us to the Orlando airport at 4:30 this morning with the agreement that they keep the car while we’re gone. They live on a nice catamaran that they sailed over here from the UK. We met in Bocas Del Toro, Panama a couple of summers ago and they turned up here in Titusville a few days ago. Having a car for awhile is handy when you live on a boat. 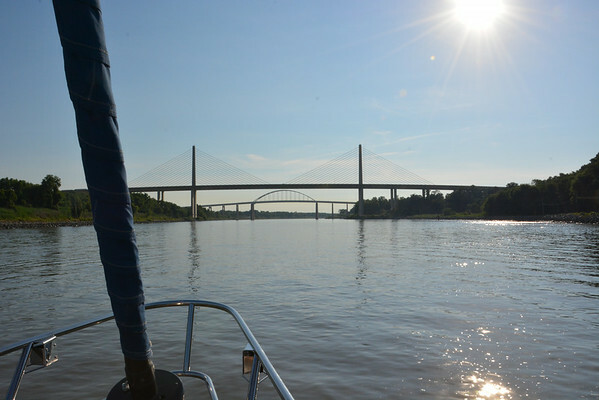 We made our way out past the fort where the Star Spangled Banner was inspired and moved northward to the Chesapeake and Delaware Canal. We got about a third of the way down when we came across a bar/restaurant/dock and we called it a night. Lots of stuff going on here in Chesapeake City. After a couple margaritas and a crab and shrimp dinner we hit the sack, even with a hundred people on the dock chatting over the band. Got away from the dock at 7, finished the canal and got into the Delaware, looking for Washington’s crossing point. We’ve been in the Delaware Bay all day, now we’re in the Atlantic headed North and should see New York about sunup. We’re dragging a fishing line hoping for a nice Tuna. After getting settled into the marina we took a ferry over to Manhattan to see the sights. So how’s this for weird. Whitney, Coco and kids went to Italy for a wedding and on the way back to Portland stopped to see Coco’s family in New Jersey. Guess who’s sitting in a marina in New Jersey? We went to Coco’s parents house and got caught up with everyone. Sitting in Haverstraw, New York. No shower needed for today as another thunderstorm came through and it started hailing. So we ran around the deck covering up the hatches. Naturally it quit hailing about the time we figured out where the covers went. Yesterday we got soaked when we took a taxi to a grocery and liquor run. Maybe tomorrow we can get a proper shower, indoors. The trip up the Hudson is a good one. Lots of brick making happened all along here. There is an interesting escarpment along the west bank with lots of rock falls similar to Yosemite in some respects. We think that Saturday morning will be the day we bust out of here early and beat feet to Albany (capital of new York). We have a couple of computers calculating gribs, isobars and weather effects as we move along. We’re all geeks of one kind or another so we shouldn’t have too many surprises. Since we have a decent internet link I’m uploading recent pictures of us from Baltimore to New York. I personally think driving a boat around New York Harbor is seriously cool. It’s busy with helicopters, airliners, ferries, tour boats, ships, barges, and people like us. Travel day on the Hudson. We left the marina without hitting anything which speaks to Rob’s skill at driving this 51 foot long boat down a narrow fairway past a bunch of small boats parked backwards in their slips. We’re used to a fairway that has enough room to flip the boat around and drive out forwards. We were jammed in pretty tight. We motorsailed up the Hudson all day seeing the sights. Both sides of the river have railroad tracks with the eastern shore carrying commuter trains and Amtrak traffic every 20 minutes or so. The western side had all freight trains carrying containers and chemicals. One treat was going by West Point, sitting like a fortress covering a large portion of hills. We got in to Catskill Creek where we’ll spend a couple days taking the mast down, building cradles and setting the 70 foot stick on our 51 foot boat. It’s going to hang out on both ends. To remove the mast, after disconnecting all the standing rigging and removing all the sails you build a couple of wooden towers on each end of the boat, then pull out the mast with a crane. That’s the plan but not what really happened. The tower building went just fine but it seems that Rob put some kind of superglue in between the mast and the cabin top to both seal it from leakage and to keep nuclear weapons from entering the boat through that hole. We hooked up a nice sized crane and pulled upwards until the entire boat came out of the water 2 or 3 inches, which is not a good thing. Then after a bit of pounding and swearing it was decided that we should just move the boat out of the mast pulling slip and into the gotta fix something slip for a couple days. So I spent the next two days digging this substance out. Think of carving a hole in a bowling ball. The material is about that hard, but can be drilled and sawed on with a small saw. I finally got the stuff out and moved back over to the mast pulling spot and the thing came out pretty easily. Easy but scary as we placed it on the newly built towers and added a third support in the middle where the mast had been. So now we have gone from driving around in a 51′ sailboat to driving around in a 70′ powerboat. Docking just isn’t the same anymore with that thing hanging out each end. So that’s what I remember most about Catskill New York and the incredible patience of the RiverView Marina staff. Gayle and I then took the boat from Catskill up to the Albany Yacht Club in Albany, New York. We joined the friday night social in the club house with everyone and as it turns out the Yacht Club members were great to swap sailing stories and they told us tales about life up in this part of the state. All the mast pulling shots are here. Sailing up the Hudson River pictures here. Do the Erie Canal…in progress. Just outside the Erie Canal, checking out the entrance. Somebody here is Gilligan, wonder who? From the inside looking ahead. Fill it up and you got a new view of the world. So where would you go to goof off away from the parents? Guess what, it’s July 16 so I think we’ll stay. Previous Post Skipping forward a few years…Half a Loop is Better than None!